Jennifer is ready to get dicing! What is the best souvenir you can bring home from Thailand? For us, it was the recipes and techniques we learned from a Thai chef at our cooking class at Anantara Spice Spoons at Anantara Rasananda Koh Phangan! After a week of eating delicious curries at nearly every meal, we were very excited to learn how to make Geang Kiew Wan Gai, otherwise known as green curry, from scratch. Although our time in Thailand would soon come to an end, we’d be able to bring home a recipe to make one of our favorite Thai dishes right at home. We met our patient chef in the beach-side show kitchen and donned our own aprons and chef hats. We quickly got to chopping, dicing, and plucking the various fresh ingredients. We were learning to make the green curry paste that we’d need to make our green curry. As Tim put some muscle into grinding all the fresh vegetables and herbs into the green curry paste, chef told us a bit about the history of Thai food. The green curry paste was already becoming fragrant and chef explained that Thai food is known for its balance of four fundamental taste senses: sour, sweet, salty, and bitter. Up to the challenge of creating something delicious from the complexity of flavors we were working with (and threatened that if we didn’t pass, we’d have a lot of dishes to wash), we slowly stirred our green curry paste on the stove. As we added the coconut milk, chicken, and eggplant, the paste began to transform into an aromatic green curry that made our mouths water. We tasted and seasoned with fish sauce, palm sugar, and chillies to adjust the spiciness. Medium spicy for us, please! But it wasn’t time to eat just yet. We were also making Tom Yum Goong, a spicy prawn soup. Another popular Thai dish known for its hot and sour flavor, we actually hadn’t tried this soup yet in Thailand. We had some more vegetables and herbs to chop up before adding them to the prawn stock to simmer. The soup is actually very easy and quick to make. After the vegetables simmered for a few minutes, we added the prawns and seasoned with fish sauce and roasted chili paste. Chef poured our soup into bowls and it was finally time to eat! We added a tad too much chili paste and ended up with a very spicy soup, but it was still delicious. Our green curry was perfect. Executive Chef Don came by to declare we’d passed our Thai cooking class – no washing dishes for us today! Tim and I were both surprised at how easy it was to make both the green curry and spicy prawn soup. The dishes are light, though look complex. But with the patient instruction of a Thai chef, you can easily learn to make delicious Thai dishes at home that are sure to impress. Best of all, we got to each take home a wonderful set of 16 Thai recipes, cutting boards, and our Anantara Spice Spoons aprons and chef hats. And we’re sharing the delicious green curry recipe with you! In a mortar make a fresh curry paste by grinding all the ingredients. Heat oil over medium heat and add the green curry paste, Kaffir lime leaves and all the spices. Stir continuously for 2 minutes until aromas have developed. Slowly add coconut milk with continuing to stir for 5 minutes. Add the diced chicken and the eggplant. Continue stirring for 3 minutes. When the chicken is fully cooked, add the chilies and sweet basil. Transfer to a serving bowl. Garnish with coconut cream, sweet basil and sliced red chilies. Serve with rice. 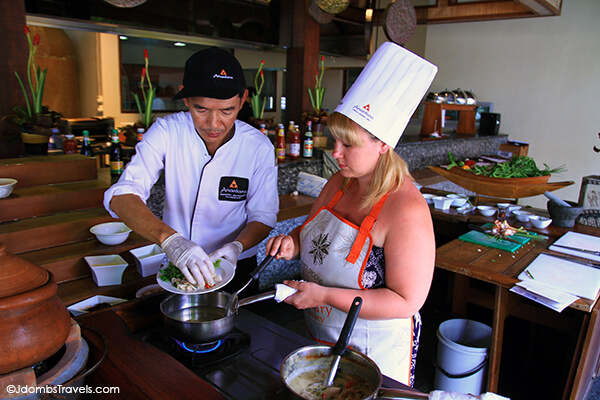 Anantara Spice Spoons cooking school is available at a number of the Anantara properties. Reservations are required at least 24 hours in advance and can be requested online. Anantara Rasananda Koh Phangan is a peaceful retreat on a part of the island away from the backpacker and full moon party area. Book a package on the Anantara website or book on our Booking.com partner site. We’ve done a couple cooking classes now and they are a really great way to connect with the local culture through the food. I’m afraid it will be a bit hard to find all the ingredients for the fresh curry paste. Pre-made green curry paste can be substituted and I think I’ll have to give that a try at home. I really wish we had taken a cooking class while we were in Thailand. The dishes I make at home don’t even compare to the food in Thailand! I’ll have to see if I can get all of these ingredients at home. Thanks for the recipe! It’s one thing to google a recipe and totally another to get hands-on time with a Thai chef. This was such a great experience! 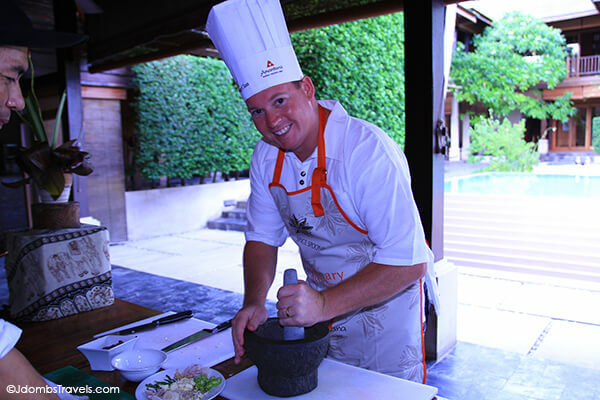 We had our cooking class on a remote Thai island, but Anantara Spice Spoons is available at many of their resorts. And many include a visit to a local market to pick out your fresh ingredients too. Yummy and fun! It’s a dream of mine to do a cooking class in Thailand. Yummy and fun indeed! I love my set of recipe cards I got to bring home. Chicken satay, another of my faves is included and I can’t wait to try that one out at home. This is what I desperately need! I’m not a natural cook when it comes to Thai dishes so a cooking lesson would be a great start! Thanks for the recipe. I’ll definitely be trying it! The list of ingredients can sometimes be daunting when I look at a recipe. So it was really awesome to have a chef show is just how easy these dishes are to make. Let us know how your green curry turns out Jenny! It’s so hard to find thai food down in Mexico, all I can do is salivate at those shots and hope to find something somewhat resembling thai cuisine in our next location. I think Thai restaurants are non-existent in Italy. I just hope I can find the ingredients so I can make up Thai food at home! On the up side, you get all the delicious Mexican food you want all the time, Devlin. That’s another cuisine we crave. This looks so tasty! Thanks for sharing the recipe! Yum-my, Jennifer. I love Thai food, especially green curry but I thought it would be more difficult to make, especially when you have to balance those four distinct flavors. But I guess that’s the beauty of it – you can adjust to taste. Thanks for the recipe, can’t wait to try it. It’ll definitely be a change from the regular curry I’m used to. Thanks for linking up this week! I was surprised at how easy it is to make too! That ingredient list is a bit daunting at first look. Pre-made green curry paste can be substituted if you can’t find all the ingredients to make it fresh. Thanks Ilaria! We’ve had the opportunity to experience six Anantara Resorts now and we most definitely recommend Anantara for world-class customer service and the unique amenities! Yummmmmmmm!! That looks SO good. I love curry. Me too, Abby! I usually opt for a red curry, but this green curry was sooo good. You guys look like real naturals in the kitchen. The dishes look divine and I can almost smell the aromas coming from the pots. What a fun experience and it looks like you enjoyed it. Thanks for sharing these recipes! The only thing better than eating when traveling is learning about new foods and recipes to carry home with you. Great idea about the green curry paste, Jennifer. Will see if I can get some this weekend. It must be the weather here in NYC, I need different spices to jazz up my cooking. The weather has been crazy this winter! We’ve had nearly non-stop rain for two weeks and literally one day of sunshine so far this year. Sometimes food can help bring you out of the winter weather funk. Mmmmm delicious. Thai Green Curry is my favourite food. It is true, Thai food is quick and easy to make. You two look so cute in your class too.